Lesley Pymm reports: This has always been one of my favourite runs of the year, although I had started to think that it was one of those that was becoming a victim of its’ own success. It used to be a lovely day out with lots of things for families to do when the children had completed their fun run – now the cost of the event was going up and there seemed to be not so much to show for it. Previously there have been quirky finishers things – great T shirts (I am not really a T-shirt person) or one year it was a skull with a nightlight in it. This year it was just going to be a medal…. There was also less going on for the spectators. There was, however, chip timing!!! Sorry, but for an off road event like this with not too many runners I can’t see the point. Anyway, I duly turned up and was looking forward to running the event which is over a great course and takes in a hamlet that was wiped out by the plague – hence the name of the run. I got there in good time and collected my chip. Had a bit of a warm up and then got into the loo queue – it was long at 10 minutes before the start, but nothing like as long as the queue for chips! Eventually there was an announcement that the race would be delayed by 10 mins so that everyone could get their chips. When it came to the start, the announcement was made that the course was the hardest ever – the weather had meant that it was very difficult out there. Apparently they had taken hours getting a landrover out the day before, after it got stuck. Off we went. It starts easily enough along a forestry track. There were a lot of puddles that people seemed to be running round, but otherwise it was OK – obviously I went through it! When we got to the water crossing after about 1/4 mile, the water was deeper than usual, so no chance of keeping dry there! Over the stream and then the first hill started. We could hear the steel band at the start/finish area playing away and bashing out a good beat to slog uphill to. We got into the forest and then ran a lovely loop through bluebells. It was fantastic and I remembered why I come back every year. 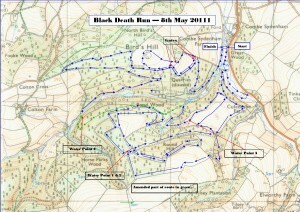 The route is really complicated with loads of loops – it looks like a spider had wondered over the map with inky feet. Although I remembered bits of it, I could never pretend to know the course. A bit further on there are a series of ups and downs in a field – I don’t really know what they are for! It was as I was running along here that I started to worry as faster runners started coming past me – had I gone wrong and short-cutted somehow? It seems not – they had got lost and were doing an extra bit! We all came out to a T junction in the forest and turned right. As we went downhill, the front runners turned around and started to come back. They said that the finish was down there – so we all turned around and went the other way. We got to another junction and there were loads of runners milling about saying that they had already been there. I joined the runners who were going downhill at this point. I was beginning to lose interest and thought that if I ended up at the finish – what the heck! Eventually I came to a marshal who said I had not come the right way – but directed me back on the course. I then did the rest of the course. The course finishes with a long climb and a run through the forest then another climb before getting to the top of the hill – masses of bluebells – and a long downhill to the finish. There was an apology on the website yesterday. It seems that some people ended up doing as little as 6 miles and others did about 14. I did about 9 1/2 miles – so did miss out a little as it should have been a bit more than 10. I did not actually run through the hamlet! I enjoyed the run, it was a good (if expensive) training run. The results are meaningless! 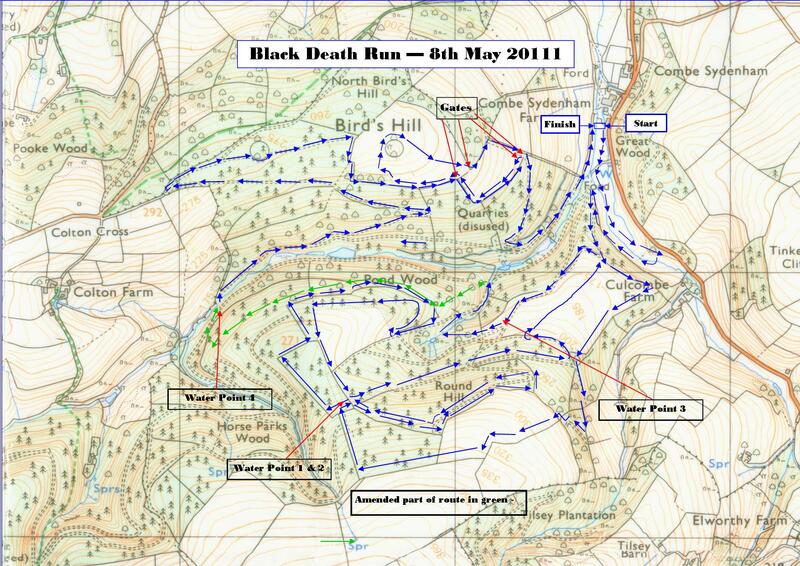 This entry was posted in 10 miles, Multi-terrain, Race Reports by Race Reports. Bookmark the permalink.